An attractive, durable tiling job takes skill and time to achieve, so it’s not something just any contractor can do. If you suspect your tiled wall or floor didn’t turn out quite the way it should have, there are a few tell-tale signs to look for. Tiling mistakes are easier to correct within the first 24 hours, before the grout sets, so always inspect a new tiling job as soon as possible. Unless the design calls for something else, such as a complex mosaic pattern, tiles should fall in line with each other. Crooked tiles can occur for a number of reasons. The grout may have been spread unevenly, or the contractor may have neglected to use spacers or battens (small rods) to hold the tiles in place as the grout cured. Wall tiles that sag in certain areas may lack sufficient support. Installing a board for support can solve the problem, but the tiling will have to be re-done. In other cases, the angle of your tiles might have nothing to do with the way they were installed. Water damage from a leak, damage from insects or overall deterioration in the wall behind the tile can weaken the grout and allow the tiles to slip out of place. Tiles that are so uneven you can see a difference between their heights or feel the difference while walking across them were generally installed incorrectly. There are some exceptions, though. Handmade tiles and tiles made from exotic materials, such as shell, may be irregularly shaped or simply exceptionally difficult to install. It’s also possible your floor or wall itself is uneven. A slight bump in the floor may become more pronounced with tile over it, so you might notice a difference where you didn’t before. A thorough contractor can grind down the high spots and fill in the low spots to create an even surface, but not all do this. If you’re using fairly standard tiles and there are no irregularities on your floor or wall, then chances are something went wrong during the installation. One of the most common problems is “lippage,” the uneven surface that occurs when a tile is higher than the one beside it. This most often shows up with large and rectangular tiles, and is caused by the contractor choosing the wrong offset, or pattern, in which to lay the tiles. Uneven application of thinset or mortar, which holds the tiles in place, is another potential cause of uneven tiles. This typically happens when the contractor was rushed and didn’t take time to spread the adhesive evenly. Uneven tiles aren’t something you should ignore. They present a tripping hazard and increase the likelihood the tile will chip on the edges. Tiles like these are also harder to keep clean. Because few spaces in a home are perfectly regular, your tile installer will most likely have to cut some tiles to fit around inset areas of the wall or a fixture such as the shower or toilet. Signs of poorly fit tiles include gaps, thick grout used to hide gaps, and thin strips of tile or broken tiles used to fill in narrow spaces. 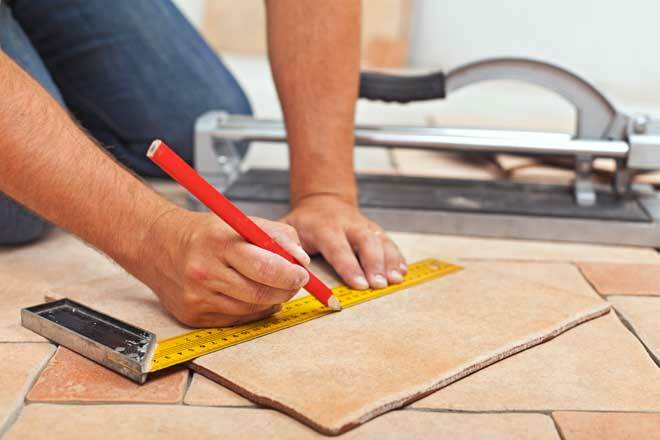 Experienced contractors plan to have around 10 percent more tile than the minimum they need to for the space to account for breakage and cutting errors. If you didn’t supply your installer with enough spare tiles, they might have made do with what they had, leaving you with imperfect results. Even so, it’s something you’ll want to address with your contractor. Grout protruding from between your tiles is a clear sign of an amateur or rushed installation job. If the grout hasn’t fully hardened, you can scrape it out with a wooden, preferably oak, stick. This will remove the grout without scratching the tiles. If the grout has set for more than a week or so, you might find it impossible to get rid of the excess. Too much grout might be unsightly, but it’s not a major problem in and of itself. It’s really only an issue if you suspect the contractor made other mistakes due to inexperience or lack of time. While some of these signs might seem purely cosmetic, they suggest a sloppy or inexpert tiling job. That means there could be underlying problems that won’t show up for a while. For instance, your installer might have used the wrong type of adhesive, which can cause the tiles to fall out, or applied the adhesive in such a way that the tiles are at risk for cracking. If your tiles are crooked or uneven, or otherwise seem poorly installed, contact an experienced tile installer to come give them a look. If the problem turns out to be serious or just something you’d prefer to correct, chances are the tiles will have to be broken and removed so the contractor can install new tile correctly.